Another headache has started daunting the Bankers. Yes, it is fake Rs. 500 rupee currency notes. How to identify a Fake currency note? Here are the tips suggested. On the left side of the obverse, one can note the denomination followed by the words RESERVE BANK OF INDIA. 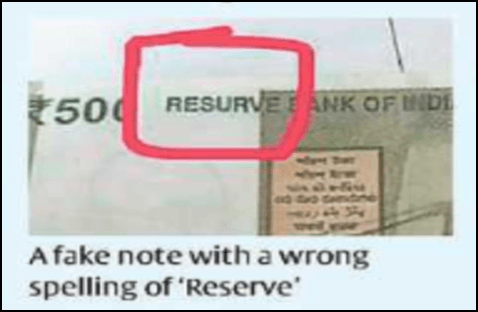 Here the word RESERVE is wrongly spelt as RESURVE. Will this be treated as a misprint or a counterfeit?? This clarification has to be given only by the Reserve Bank of India, the lender of the last resort. RBI officials add that they are not aware of this threat. They add that the issue of Fake currency notes was not discussed during their last meeting on Currency Management a couple of days ago. No credit should be afforded to a customer if a counterfeit currency is detected at the counter or at the back office/currency chest during receipt of cash. Also, the counterfeit note should not be returned to the Tenderer or destroyed by the bank branches/Treasuries since they are required for investigation purpose. However, a receipt can be given to the customer acknowledging the fake notes impounded. Let us face the issues if any related to the above menace.